Sign Up for the Mini Brigade! Region 17 presents something new at the Winter Harmony Weekend: a Mini Harmony Brigade! What is a Mini Harmony Brigade, you ask? 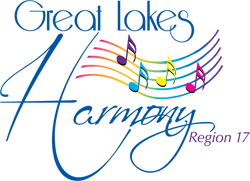 It is a chance to sing your part quartet-style throughout the Winter Harmony Weekend with everyone else who signs up! Here’s how it works: First, you register. Registration opens Nov. 1st. Then, after the December 17 deadline, you will receive the music and learning tracks for two songs, which you learn, ready to sing off the paper, by Winter HW. The Brigade organizers make sure there are an equal number of people for each part. This is important because… you get to sing with every other participant that is not your part! You fill your dance card by singing in quartet with all the other participants, identifiable by color-coded stickers on their name badges. Sing during dinner, between classes, at breakfast, at the boutique… you get the idea. Registration was online and first-come, first-served… so if you are interested Sign Up Now to be placed on the waiting list. Registrations close on Saturday, December 17 to give participants enough time to learn the music and arrange some local run-throughs before Harmony Weekend. If you have any questions about the Mini Brigade, contact us at [email protected] and we will answer your questions.